Under-pressure Real Madrid coach Rafa Benitez believes there is a campaign against him and the club and that the team is not playing as badly as is being made out ahead of the La Liga game against Real Sociedad on Wednesday. 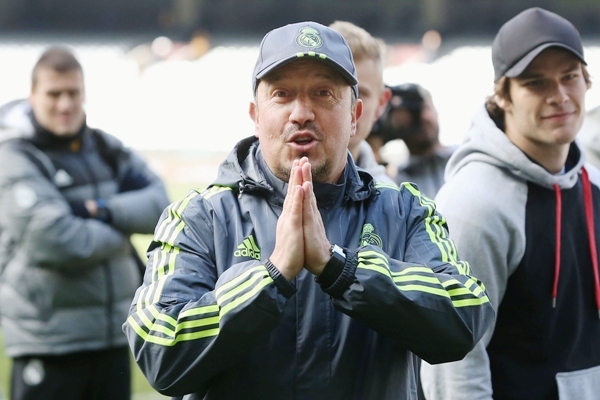 Speculation has been rife in the Spanish capital over the future of Benitez who has failed to win over many fans with his team's results and style of play this season. "There is a campaign against (president) Florentino (Perez), Real Madrid and me," Benitez told a news conference on Tuesday. "Everything is criticised that can be and where not it is manipulated which anyone can see. This is particularly clear if you look at the situation from the outside." Real face Sociedad on the back of a crushing 10-2 win over Rayo Vallecano but the result was distorted by two sendings-off for the visitors who looked strong early on and held a 2-1 lead. Although they have scored freely against the more modest sides, Real have generally been unable to beat stronger opponents and a humiliating 4-0 loss to arch-rivals Barcelona last month was particularly damaging for Benitez. Real are two points off joint leaders Barcelona and Atletico Madrid with 33 points from 16 games, but the Catalan side have a game in hand after playing in the Club World Cup. "Everything is being magnified and I have a lot of experience coaching so I know to be distracted as little as possible," Benitez said. "I have 24 players in the squad but when I leave out one player then it is made out that it is something personal and a load of speculation is built up. The team is a lot better than people think. "My relationship with the players is infinitely better than what you read in the press. There is a communications department that keeps me informed. The team is doing some things well and others not so much." Benitez said he was able to relax over Christmas which he spent with his family in northern England where he used to manage Liverpool. "It was calm. I had a short holiday as we are playing again on the 30th," he said. "Fortunately, the English press do not exaggerate as much and so it was relaxing with the family and concentrating on how to beat Real Sociedad and win trophies this year."